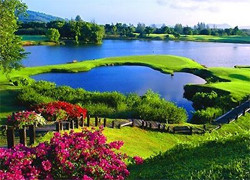 For such as small island, Phuket owns a large selection of high-quality golf courses. There are six golf clubs altogether, owning ten golf courses between them ranging from 9-holes to full 18-hole championship courses. The prices for golf in Phuket can be quite expensive in relative terms when compared to Europe, America and Australia, but the conditions and facilities are excellent. The cheapest way to play the courses would be to tag onto a member, because the green fees can be slashed by a third when playing a round with the member. However, this is not always possible, so by using our information you can contact the courses directly. 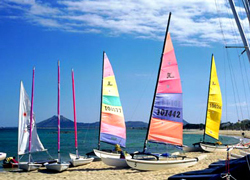 There is also the option of contacting local Phuket companiesthat can arrange rounds of golf and transportation for you. This can be an ideal stress free option. The golf magazine, Asian Golf Monthly, rated Banyan Tree Golf Course in the ‘Top Ten Best Golf Resorts in Asian'. This par-71, 18-hole golf course is Phuket's only resort-based golf club. Featuring a scenic environment built upon natural lagoons, the Laguna Golf Club owns undulating fairways and hazardous water features to manoeuvre around. 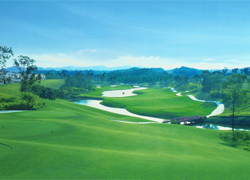 The mountainous backdrops and nearby Andaman Ocean creates wonderful conditions to play a leisurely round or two. The golf club is situated at the Laguna Phuket Resort within close proximity to Bang Tao and Surin at the northwest of the island. 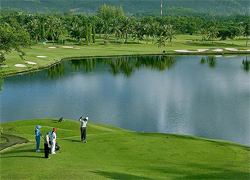 The Blue Canyon Country Club has become Phuket's most famous golf club, with its two top-quality championship courses. The world-famous Canyon Course and its adjoining Lakes Course are the proverbial golfer's paradise. Top names in world golf such as Tiger Woods, Ernie Els, Fred Couples and Retief Goosen have all played the Canyon course in Asian Tour Events such as the Johnnie Walker Classic. Both courses are tree-lined with carpeted fairways and dangerous water hazards. The Canyon course is infinitely more difficult than the Lakes, although both are tough tests for players of all handicaps. The canyon course, as the name might suggest, is built on a natural canyon, which is home to signature holes such as the 13, 14 and 17. 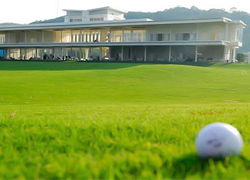 If you have come to Phuket to enjoy a round, you are doing yourself an injustice by not visiting the world famous Blue Canyon Country Club, situated within close proximity to Phuket International Airport in the far north of the island. At the Loch Palm Golf Club at Kathu, you have the choice of two high-quality golf courses at your disposal. The long-established Loch Palm Golf Course and the recently built Red Mountain Golf Course are both supremely constructed courses set to test even the best players. 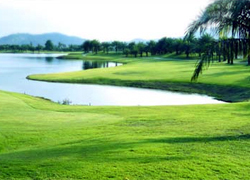 The Loch Palm Golf Course is centred around its Crystal Lake, which is a massive 48 acres in size. This 18-hole, 72-par golf course owns 6,555 yards of tree-lined surroundings with the mountains as a backdrop. With its sneakily hidden bunkers and tricky water features that come in to play on the majority of holes, this course is better suited to high handicappers or those who enjoy a scenic round. The Red Mountain Gold Course on the other hand is a highly testing venture meandering its way through dramatic scenery on the 1,400-rai site of a former tin mine. The immense elevated holes make this golf course probably the most aesthetically pleasing on the island. The course has been dubbed ‘the most exciting new course in Asia'. 38 Moo 5 Vichitsongkram Rd., Kathu District,Phuket 83120, Thailand. Golfing demigod, Jack Nicklaus, designed the Phuket branch of the world-famous Mission Hills brand. How is that for name-dropping! The Mission Hills Golf Course is one of the flattest in Phuket, but nonetheless is still a testing experience. This 18-hole golf course is set over an area of 6,806 yards of Paspalum Sea Isle 1 grass fairways and Paspalum Sea Isle 2000 grass greens. One of the unique features of the course is that 9 holes are actually floodlit and can be played at night. The course is situated oceanside in the Amphur Thalang region of the island in the northeast, within close proximity to Phuket International Airport. The facilities at Mission Hills include an expansive spa and lavish resort. 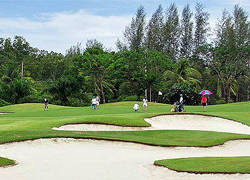 The Phuket Country Club in Kathu owns two golf courses, which are the best value for money on the island. The Old Course is the main 18-hole course that defines the club, and the 9-hole Country Club Course is a water-laden and tricky course that might require an extra trip to the club shop for more balls. The Old Course is one of the most popular courses on the island and is centred around the large lake. This tree and jungle-laden course is best enjoyed by high handicappers because of its wide fairways and very playable holes. The par-5 10th hole is a dramatic challenge that circumnavigates the entirety of the lake. You can actually drive the 10th green in one shot, but believe me you will have to be a massive hitter. The Old Course provides an enjoyable golfing experience. The Country Club 9-Hole Course on the other hand is very difficult with water features coming into play on nearly every hole for every shot. You will have to be striking the ball well to obtain a good score on this beauty of a course. This is Phuket's newest built golf course, situated opposite Chalong Temple off Choafa Road West. Although this 9-hole course is in its early stages and will need more time to grow into its surroundings, its value for money prices and mountainous scenery still makes it a great place for a quick round. Alongside the array of water hazards and sand traps, the greens and fairways are in good condition for a course so young. The course is also floodlit, so it matters not what time the sun sets because golf is available around the clock. The added bonus of visiting Phunaka is the brand new driving range facilities and a golf academy where affordable lessons can be purchased from a PGA pro. 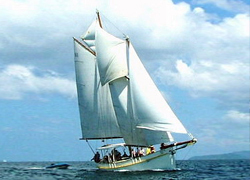 As one could imagine, Sailing in Phuket is a popular pastime tourists and expatriates alike. 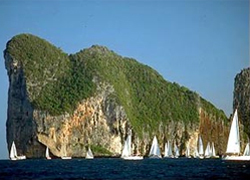 Phuket is very fortunate to be positioned beside the Andaman Sea, being one of the best places in the world for sailing or to be used as a base to explore the surrounding regions. The subtropical climate is the perfect environment for sailing, especially with the outlaying islands that surround Phuket. Phuket Marina Services – This is a general marine consultancy service situated at Koh Kaew. They specialize in boat construction, boat refits and surveys, alongside boat purchasing and charters. Precision Shipwright Services Co Ltd – If you are seeking refits and repairs, mechanic or structural, this quality service company at Boat Lagoon Marina is for you. First Class Yachts Group – This company at the Yacht Haven Marina specializes in yacht and charter management programs and services. Yacht Solutions – Situated at the Boat Lagoon Marina, Yacht Solutions is ideally positioned to provide boat owners with services such as charters, yacht management and delivery, parts and supplies and numerous repair and refit services. 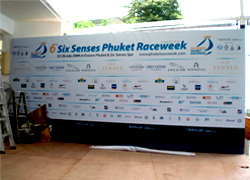 Normally held from mid-late July, the Six Senses Phuket Raceweek is an annual event that is scheduled over 4 days. 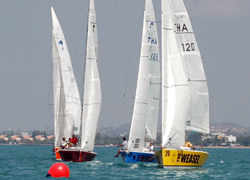 The race has over 400 participants with 35-40 boats from across Asia taking place. The interesting layout of the course is a mixture of round-the-cans and round-the-islands, which provides a testing challenge for everyone involved. If you are not a seafaring individual, you can always limit your expeditions to the famous regatta parties that have become as important as the race itself. The HQ for the race is the Regatta Bar at the Evason Phuket Resort at Rawai. 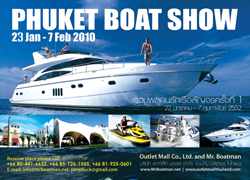 The Phuket International Boat Show has become a permanent fixture for the best part of a decade. 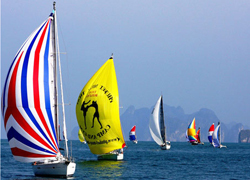 This annual event is normally held in January at the Phuket Royal Marina. This boating and lifestyle exhibition sees visitors from across Southeast Asia and further afield. This is a must visit for executives in the marine and boating industry, with over 80 companies showcasing approximately 45 sail and power yachts. 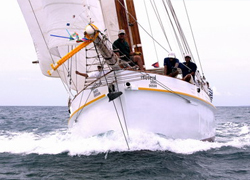 Named in honour of His Majesty King Bhumibol Adulyadej, the Phuket King's Cup Regatta is a permanent fixture on every self-respecting sailor's agenda in Phuket and is now the largest and most prestigious regatta of its kind in Asia. Participants come from all over Asia and Australia to partake in the event, held in December each year. 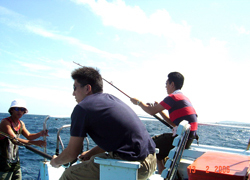 The quality of fishing in and around Phuket is often cast in the shade by the more popular activities available on the island. Those in the know will inform you that Phuket has some of the best deep-sea and sport fishing options available anywhere. There is a plethora of catch within your scope when fishing in the Andaman Sea, such as sailfish, Blue and black marlin, dog-tooth tuna, jacks, giant trevally and swordfish have been caught in the area. The island's catch-and-release policy protects the marine life and ensures that generations to come can enjoy the same environment and fishing conditions. The Andaman Ocean is a hotbed for game fishing, whether you are trawling around the nearby Racha Island or exploring further afield around the Similan Islands. 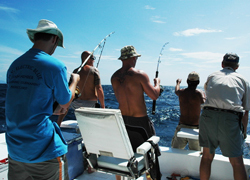 Favourite game fishing destinations include the Andaman Islands, Surin Islands and Koh Rock Island. Racha Island and the Surin Islands are the easiest places to fish location wise, but a trek out to the Similans or the Andaman Islands will take much longer but is more rewarding long-term. 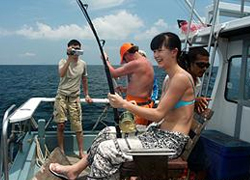 All major tour operators can organize a trip game fishing, or alternatively, you and your friends could charter a boat from the numerous boat charter companies and explore at your own pace. 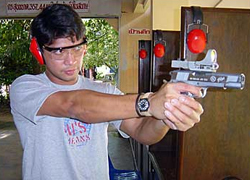 The most popular shooting gallery on the island by a long shot is the Phuket Shooting Range, situated close by the Greenman and go-carting track in Chalong. Check out and try out the arsenal of weaponry such as AK-47s, M-16s, Colt .45s, Smith and Wesson .38s, 9mms, and .22 magnums. Fire away at the bulls-eye and outdoor and human falling plates until your heart is content. The price range depends upon the amount of ammunition, gun type and the equipment you use. Trained staff are on hand to give you advice, make sure things run smoothly and that all safety procedures are followed. Situated on the ground floor of the Jungceylon Shopping Complex in Patong, the Shooting Café offers a trendier angle for sharpshooters with its shooting gallery and adjoining café. Sip on a Latte and then stroll into the brand new range and fire away. Firearms enthusiasts or those just looking for a good time and unique experience will get to handle a vast array of weaponry that includes the 9 mm Glock, .22 caliber rifles and pump-action shotguns. The staff are friendly, well trained and fully understand the safety procedures that are involved with such a dangerous activity. 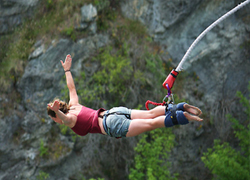 Jungle Bungee Jump If high-risk activities are what make you tick, you will be happy to know that the Jungle Bungee Jump at Kathu is ready to take you for a ride you will never forget. The 50m jump is set over a lagoon and lush jungle vegetation. The company provides full insurance, and since its opening in 1992, has a 100% safety record. Always nice to know! The park is situated in Kathu, between Patong and Phuket Town. 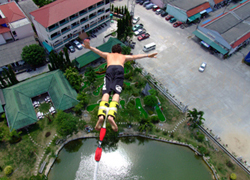 Situated in the heart of Patong at Sainamyen road, Soi Kebsap, you will find the high-octane World Bungee Jump, which provides much needed alternative entertainment. The 60m jump claims to be the highest in Southern Thailand and we will let you vouch for that. 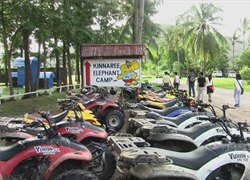 Kinnaree House ATVs If you are interested to take a couple of hours driving the fun packed ATVs around a purpose built track, Kinnaree House at Chalong will be the ideal location. This is not a jungle track or anything of such sorts, but is a small yet fun track with enough humps and hollers to make it an interesting afternoon. This ATV track is situated in Chalong at the same company that owns the go-cart track and shooting range. 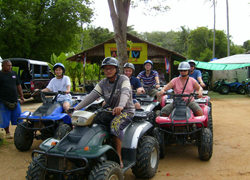 This company specializes in providing ATV tours all over Phuket and the neighbouring Phang Nga province. By using this respected company, you can easily organize a full day trip to the best places for ATVs. Enjoy the scenic ride through rubber plantations, small Thai villages, waterfalls and farms. With this company, you can experience the best an ATV expedition has to offer. This respectable kite boarding company was formally situated at Nai Yang Beach but has now moved to Chalong. 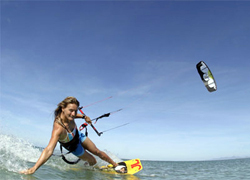 With Kitesurfing Phuket, you can partake in Kite boarding lessons, trips and downwinders. 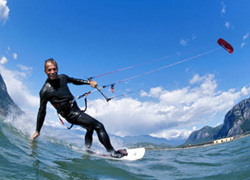 They have a vast array of equipment at their disposal, which makes this one of the premier kite boarding venues in Phuket. You could alternatively hire the kite boarding equipment from the shop and try out your newfound skills at Karon or Kata beaches if you wish. Make sure the jet-ski you hire has no damage, because this can and has been blamed on tourists who did nothing wrong. 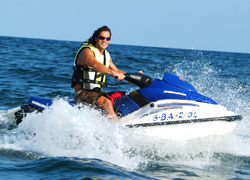 This has resulted in big cash settlements or threatening behaviour from the jet-ski owners. 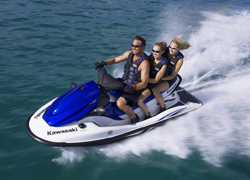 Check the jet-ski is undamaged with the owner beside you. This will ensure the owner knows you understand what you are dealing with and will not take any scam aimed towards you. If you do happen to become involved in a jet-ski scam, have the tourist police telephone numbers handy and call them before you hand over any money. Be careful when driving a jet-ski. There are designated jet-ski areas, but you want to be sure nobody is swimming in the vicinity. This is Phuket's oldest marina, which has been in operation since 1992. Situated at Sapam Bay on the east coast of Phuket, this 168-berth marina is positioned at the head of the two-mile creek named Klong Tha Rua. The numerous canals that meander through Boat Lagoon are an ideal backdrop to the plethora of high-class residential properties within the gated community. Short and long-term rentals are all available on Boat Lagoon, and with its great selection of facilities and restaurants such as La Taverna and the Watermark, you couldn't find a more tranquil and appropriate atmosphere to live or spend time. As with world class marinas, Boat Lagoon offers many services that include 168 berths, dry stack storage for 20 speedboats, a fuel dock, a work area and hardstand for up to 80 boats, excellent changing rooms and facilities, a convenience store, bakery and restaurants. 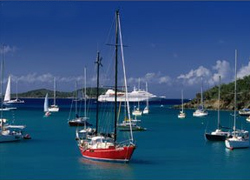 There are also many local companies that provide onsite yacht management services. 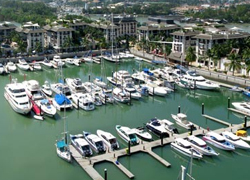 The Royal Phuket Marina is an expansive and exclusive lifestyle marina, which not only offers world-class yachting facilities, top class restaurants and a fitness & health club, but also high-end luxury properties by the boatload. This state-of-the-art marina has become Phuket's ‘place to be' for the trendy crowd and is a fine destination in the evenings when visiting restaurants such as Skippers Bar & Restaurant, Limoncello, Las Anges and the Boathouse Regatta Restaurant. 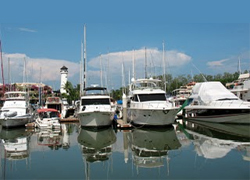 The facilities at the marina include over 350 berths, 85 of which are wet berths and 120 are dry berths. Moorings are available to both private owners and the public, which can accommodate vessels up to 35 metres. The Royal Phuket Marina is also home over 400 luxury villas, stunning penthouses and chic condominiums. 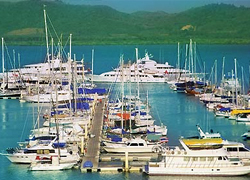 With 24-hour security and so many things to do day or night, it is hardly surprising that the marina has become a prized possession of the Phuket tourist industry. Situated at Laem Phrao, close to Sarasin Bridge at the northernmost point of Phuket, you will find the Yacht Haven Marina, which can be accessed by the east side of the island during any tide. The marina has been operational since 1997, owning 150 berths for vessels as large as 60 metres. Due to its convenient location within close proximity to Phang Nga Bay, Yacht Haven has become the home away from home for the rich and famous. Its location within a short distance to Phuket International Airport has endeared many boat owners to the marina, who casually fly in for quick weekend getaways. This might be Phuket's least publicized marina, but its location ensures a high level of usage. The new deep water Chalong Marina is due for completion in September 2012 at a cost of 235m THB. The marina will be the main check-in point for sailors and has docking space for 50 yachts up to 30m in length. The facility includes passenger terminal, immigration, customs and Thai marine department. 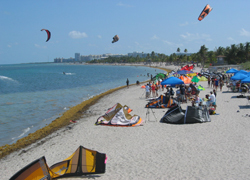 The bay is the only year-round anchorage on the island. The Ao Chalong Yacht Club can be found on the beach to the north of the new jetty. The road from the jetty leads to Chalong Circle - a five-way roundabout - accessing roads to Rawai, Nai Harn, Kata, Phuket Town and the main highway to the north of the island, passing the three main shopping centers on the way to the airport. Prime location at the entrance of Phang Nga Bay. "Ao Po Grand Marina is my number one pick of all the marinas in Thailand. The location looks directly at magnificent Phang Nga, the fuel dock is ideally located, rubbish collection and security are world class. I have ...."
Bill O'Leary, retired GM of Amancruises and author of the "Andaman Sea Pilot"
24 hour access, zero tide restrictions. 200 berth marina with yacht length up to 80m. Deep water, high capacity fuel dock. First class Marina Village (under construction). Shell V-power diesel through standard and high capacity fuel pump (400 l/min). Electric power supply (Single phase 16A, 32A, 63A, 3phase 63A, 125A, 200A). Metered water to all berths. Boat ramp with launching facilities for all trailerable boats. Haul out facilities & hard stand (future development). Extra wide pontoon walkways (4.6 m), berth sizes and marina entry (50 m). Pontoon access and transportation with golf buggies and hand trolleys. You would naturally assume that Phuket's main tourism draw is its sundrenched holiday beach locations, its exotic culture or its vibrant and alternative nightlife entertainment. Diving actually is at the top of the list in regards to pulling tourists towards the island. Phuket, the surrounding islands and the coral reefs are known as being some of the best in the world. One only has to visit Karon, Kata or Patong and you will find hundreds of dive shop companies plying their trade on the island. It is natural for visitors to simply walk into a dive shop and organize lessons and PADI courses at will. 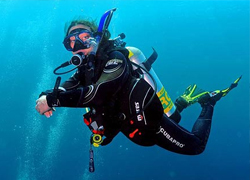 However, you are safer to understand every aspect of the Phuket dive industry before you even visit the island so you are fully prepared to make the most out of this once in a lifetime experience. The Shark Point (Hin Mu Sang) – As its name might suggest, this dive location is where you have the opportunity to see the sharks in their natural habitat, mainly sharks of the Leopard variety. This colourful dive location is very popular and easy to reach. King Cruiser Wreck – The King Cruiser was the unfortunate 85x25 metre passenger ferry that sunk a few hundred metres from Shark Point. This is an interesting wreck to delve and explore. Anemone Reef – Less than a mile away from Shark Point, this large single submerged rock is covered in sea anemones, hence the name. Racha Island – This is one of the most advertised dive areas surrounding Phuket, offering clear and easy dive conditions. This is the ideal spot for snorkelling or diving beginners and a great place to observe the colourful marine life. 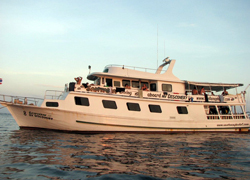 Similan Islands – Simply one of the most famous dive locations in and around Southern Asia. With its majestic National Park, amazing coral reefs and the teeming tropical marine life, the Similans are the place to visit if you are a serious diver or seeking out endless natural beauty. Richelieu Rock – Lauded as Thailand's best dive site, which is some accolade in its own right, Richelieu Rock is the best place to observe Manta Rays, Whale Sharks and a vast array of tropical marine life around its colourful corals. Koh Surin – If you are scuba diving enthusiast, Koh Surin provides the best location one could imagine. Giant clams, marine shrimps, manta rays and sea turtles are all on the agenda when snorkelling around Koh Surin. Burma Banks – In the nearby waters of Myanmar, you will find the famous Burma Banks dive site. Open-ocean diving is on the agenda at Burma Banks, where you can explore the Rainbow, Big, Silvertip, and Roe Bank, plus Coral and Heckford Banks are where you are guaranteed to encounter sharks. You may also catch an occasional glimpse at the grey reef shark if it's your lucky day. If you're interested in taking your PADI course or need to find some expert advice and services to organize and plan your diving expeditions, we have provided a short list of the dive companies that have a good reputation to simplify your choices. 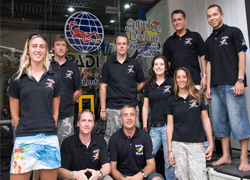 Situated in the heart of Karon, Sunrise Divers is one of the most highly regarded dive companies on the island. They can organize your PADI course, day trips, liveaboards and provide you with the best information on Phuket dive sites. 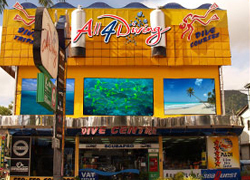 This reputable dive company is situated at Patong Beach. Providing a vast range of PADI course options, junior or advanced, All 4 Diving is a great place for beginners to sample. 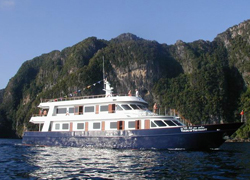 They can also organize day trips and extensive liveaboard excursions. On the Beach Road at Patong, you can visit the Santana Dive Shop. Here you will be sure to find the day trip or advice you are seeking. They have already been around for 25 years and know their stuff. If you want to dive around Burma or Indonesia, this is the company you should choose without hesitation. On Soi Sansabai at Patong, the Sea World Dive Team can provide you with a full range of PADI courses, day trips and liveaboards. They also specialize in organizing trips to Indonesia and Burma. If you are staying at Kata Beach, Dive Asia comes highly recommend for multiple day cruises to the Similans and Surin National Parks. They can also organize a wide range of dive trips to all local dive destinations, alongside helping you with your PADI course. 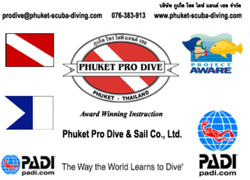 Situated at Rawai, Phuket Pro Dive & Sail is one of the best places to do your PADI course, alongside numerous courses such as ‘Adventure Diver' and ‘Rescue Diver' for both adults and children. 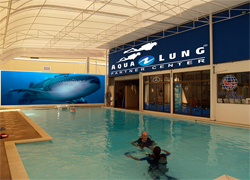 They also specialize in organizing day trips to the Similans, amongst many others. If you are staying in Rawai, this is the place for you. Every man and his dog who visited Phuket decided to take an organized boat trip to Phi Phi or the outlaying island within the close vicinity. What you might not have wondered is you and your holiday companions could charter your own boat and explore the delights of the Andaman Ocean or Phang Nga at your own will and pace. Nothing is better than being in control of your own destiny with a boat, skipper and crew at your beckon call. You might want to explore the deep blue abyss and organize a game-fishing trip or just relax on the crystal waters in your own luxury yacht and play the millionaire lifestyle for a day or two. Of course, to make such a thing happen, you will have to know which companies are available to charter boats. This is why our informative list of boat charters is here. This friendly boat charter company in Kamala can help you explore the blue azure ocean with their selection of yachts and boats. 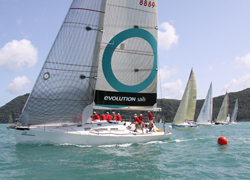 From adventure cruisers and day trips, to regatta races, this is a high quality service for experts or beginners. 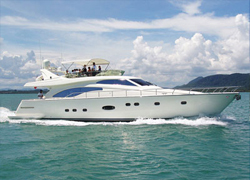 Charter Yachts Phuket Co., Ltd. This is Thailand's premier yacht charter company, with experienced European management situated at the exclusive Royal Phuket Marina. This high standard and reputable company specializes in providing international standard crews, large yachts and twin-engine speed boats. Ideally situated at the Boat Lagoon Marina, Elite Yachting is one of Phuket's premier boat charter companies with a great reputation. They specialize in chartering and distributing Cruise monohulls, Match Series, Bavaria Yachts, and Sport powerboats. If you want a wide selection of vessels, Elite Yachting is a solid choice. With over Six Years of providing Sailing and Motor Boat Charters around the islands and beaches of Phuket, Phi Phi, Krabi, Phang Nga Bay and The Similan Islands, Epic Charters ensures that its clients expectations and requirements are not only met, but exceeded. Epic Charters is an experienced, dedicated and professional team of like minded people who enjoy the tropical lifestyle here in Phuket, Thailand and wish to share their experiences with you. 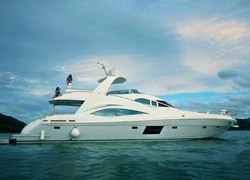 Situated at the Yacht Haven Marina, you will find the experienced and respected Phuket Sunseeker Charters. If you are seeking a private motor yacht charter with the minimum of fuss and hassle, this reputable company can and will do everything to make your trip a pleasant experience. Sea-Phuket Dot Com Co., Ltd The Andaman Sea, with Phuket as its hub, will always be Thailand's reigning maritime jewel. Here we find some of the most beautiful islands and beaches in the region, crystal clear waters and stunning geography. The diversity of that geography is also a powerful attraction. We have assembled a large number and wide variety of Sailing Yachts and Power Boats which are available for Charter in these magnificent waters. The list is, by no means, exhaustive but represents the significant commitment and investment that the Yacht Owners have made in this region. The Twinpalms One 76' luxury yacht is a brand new vessel that can be chartered to carry 20 people during daytime excursions or 8 persons for overnight journeys. 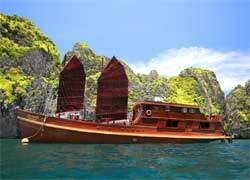 The boat has received rave reviews and can be chartered from this Chengtalay based company. If you are looking for a reliable boat charter company in Patong, Viking Cruises is a great choice. The friendly staff are always on hand to provide you with sound advice and reliable vessels for affordable prices. 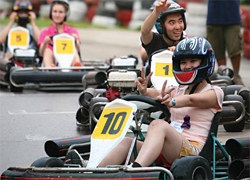 At the foot of the hill that leads from Patong to Kathu, you will find the adrenalin filled Patong Go-Kart Speedway track. Don't be fooled by its name because the course is situated on the Kathu side of the hill. This purpose-built go-cart track is floodlit, owns a café/bar area and is the place to be if thrills and spills are your forte. This is also wholesome family entertainment because the company owns two-seaters, which is ideal for introducing your children to high-octane pleasure. There are also standard single karts, super high speed karts and kids karts thrown in for good measure. The 750-metre track is an awesome place to spend an afternoon or evening. 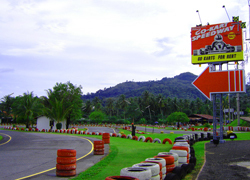 This is a newly built go-cart track (2009) situated on the grounds of the Phuket Shooting range on Patak Road in Chalong. This purpose-built 700-metre track owns a nice little café/bar, which is a great place to sit and watch the cars speedily fly around the course. There are standard single seat carts and two-seaters, which are ideal for taking your child along for the ride. Elephant trekking in Phuket is one of those must-do attractions when visiting the island, such as taking a Thai Massage, sampling Phad Thai or enjoying a night out on Bangla Road. A visit to the island without riding one of these majestic beasts would be an anti-climax. 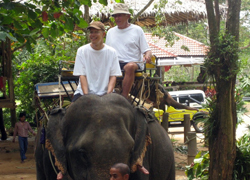 Fortunately, elephant trekking options are plentiful in Phuket. You can either book elephant trekking trips from the numerous tour desks scattered around the island or contact the companies directly from our suggestions. 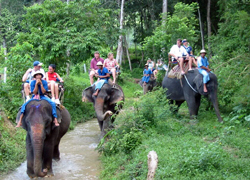 Set within a scenic jungle terrain at Kata Noi, the Kok Chang Safari Elephant Trekking is one of Phuket's most respected. They treat the animals well and show respect to visitors at all times. A ride through the jungle-laden track can take anywhere from 20 minutes to one hour. The fully trained staff will take you on a journey through dense jungle scenery, where you can see the elephants at their best. 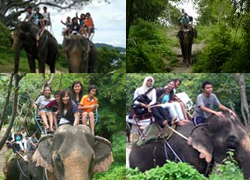 This friendly elephant trekking company is situated at Kalim within a short distance to Patong. Here you can enjoy elephant treks through jungle vegetation and also observe the ocean views while doing so. You can book the elephant treks from anywhere between 30 minutes to one hour. 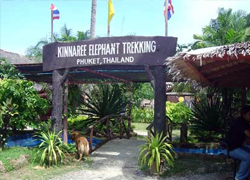 Situated in Chalong at the same venue where the shooting range and go-cart track is positioned, the Kinnaree House elephant trekking company is one of the oldest in Phuket and one of the most reputable. You can enjoy a trek through the scenic jungle terrain at Chalong courtesy of the well-trained handlers. Muay Thai boxing is one of the hardest contact sports known to man. 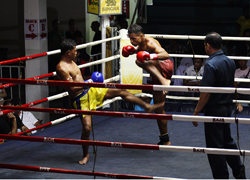 Phuket is a great place to enjoy live Muay Thai bouts in purpose-built stadiums. Some people also come to Phuket to learn or further their Muay Thai boxing skills. There are numerous gyms dotted across the island, which teach the sport and provide the training. Although there are many gyms offering Muay Thai training, we have listed the most popular and respected. 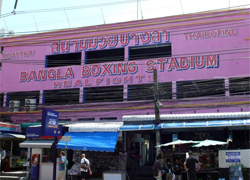 Situated on the corner of Bangla Road at Patong, the Bangla Boxing Stadium is Phuket's most famous and visited by tourists. They hold live Muay Thai bouts every week, but you will have to check their billboard outside the stadium or seek advice from tour desks to check the dates of the bouts. This stadium has an exciting atmosphere and is the place where most tourists experience their first Muay Thai action. The stadium is more commercial than some of the other boxing stadiums on the island, but nevertheless, it is still a great night out. In the heart of Chalong on Choafa Road East near Phuket Zoo, you can experience real Muay Thai boxing at the Suwit Stadium. This is an earthier and real experience as opposed to the commercial style stadium at Patong. Here you will notice is where all the Thais go when they want to catch some Muay Thai. To find out when live boxing bouts are available, you will have to visit their website or gain information from the tour desks, although the stadium generally holds live bouts on Friday nights. This is an authentic Muay Thai Boxing experience with a rowdy atmosphere. 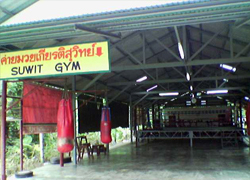 The Phuket Boxing Stadium at the Saphan Hin district of Phuket Town is the island's favourite boxing stadium. This is generally where the Thais go when they watch Muay Thai, so you know this is the best option of all. You can find out when the fights take place by visiting a tour desk in the area you are staying. Friday night is normally fight night at the Phuket Boxing Stadium, but that is not set in stone, so check beforehand. Situated at the Suwit Boxing Stadium, this high quality training camp provides accommodation, Muay Thai training and the possibility of organizing a boxing bout for you if they think you are good enough. This is one of the most respected training camps in Thailand, never mind Phuket. Contact the owners directly through their website for more info or to book your time at the camp. Within a peaceful environment at Kata, the Phuket Muay Thai Gym and Camp is a well-organized operation that offers expert training and a good selection of equipment. You can actually stay on the grounds of the camp within very nice wooden Thai bungalows. The training plans are aimed towards those who are curious, seeking exercise or are serious about pursuing Muay Thai boxing as a career. If you have no prior experience, this would be the best place to start out. The Rawai Muay Thai Training Camp enjoys a peaceful location, which is great for those seeking a tranquil Muay Thai retreat. The club not only specializes on boxing, but also covers every aspect of fitness training, which is great for those who partake in marathons or athletic meetings. You can stay in the nearby Rawai beach or opt to stay in the accommodation provided at the gym with a host of other boxers. Either way, this is a great training camp for beginners or experts. This well respected and reliable horse riding company is situated in Rawai, offering top quality treks through jungle and beachside terrains upon well-trained Australian horses. The horseback ride trips are either one or two hours long for very reasonable prices. All the staff are highly trained, which is ideal if you are a beginner. There are designated horses for beginners or experts, so all abilities are catered for. Located at Bang Tao, Phuket Laguna Riding Club is one of the few places you can hire a horse with trained staff and trek through jungle terrain and stunning beachside scenery. The trip at this club can last anywhere from 30 minutes to two hours, the choice is yours. 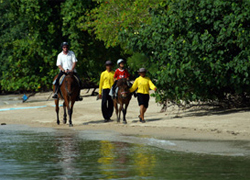 This experienced club is the best option for horseback riding in Phuket.